There's nothing quite like the smell of homemade bread baking in the oven. It's really not hard to make either! Today is Homemade Bread Day. Below is a recipe for Whole Wheat Bread I found online. If you want a less time consuming bread, there was a previous St. Patrick's Day post with a Soda Bread recipe. 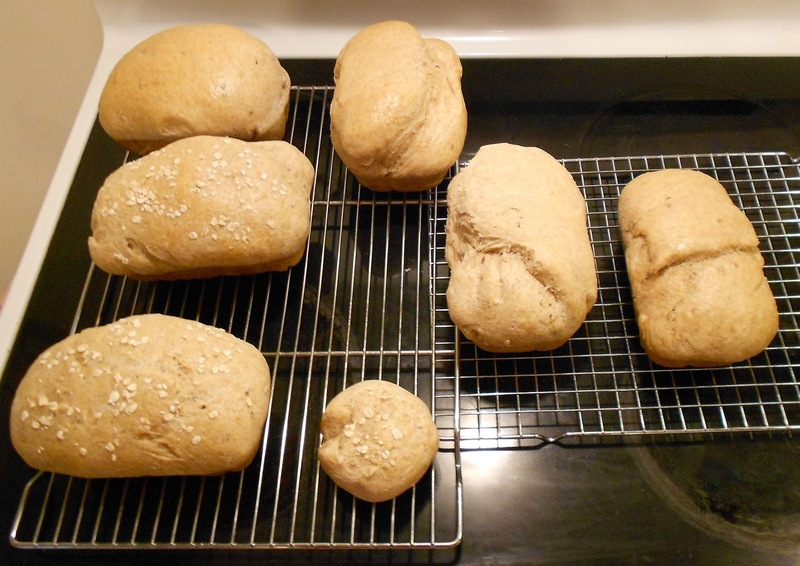 If you make the wheat bread, have your kids help punch down the dough! loaf pan. It turned out really well. Prep: 20 min., Cook 25-30 min., Ready in 3 hours. This is a basic recipe, but it can be changed in many ways. See the Daily Messes (DM) Tips and Variations below! 1. In a large bowl mix warm water, yeast, 1/3 cup honey. Add 5 cups white bread flour, stir to combine. Let sit 30 min. or until big and bubbly. 2. Mix 3 tbsp melted butter, 1/3 cup honey, and salt together and add into large bowl with flour/yeast mix. Mix. Stir in 2 cups wheat flour. Knead until not too sticky (smooth), about 5-8 minutes. DM Tip: Knead in a bowl, so you don't have a mess to clean up on your counter! Dough may take an additional 2-4 cups whole wheat flour during kneading to reduce stickiness. 3. Butter a large bowl and place in the bread dough, turn once to coat both sides of dough. Cover with clean dish towel. Let rise in warm place until doubled. DM Tip: In cold climates, turn on oven light (NOT the oven), cover, and let rise in oven. Light gives off enough heat to help rise. 4. Punch down. Divide into 3 loaves and place in greased 9x5 loaf pans. Allow to rise until dough has topped pans by 1 inch. 5. Bake at 350 degrees F for 25-30 minutes. The bread is done when it sounds hollow when tapped on the bottom. Lightly brush tops of loaves with 2 tbsp melted butter to prevent crust from getting hard. 6. Cool completely on rack, not in pan. * Can substitute sugar for honey, use same amount. * Substitute unsweetened applesauce for butter. * Can wrap, bag, and freeze. * Add flax seeds, sunflower seeds, 10 grain mix. * Use all whole wheat flour. * After brush the tops with butter, sprinkle on oats. * Cinnamon Raisin: Roll out dough. Sprinkle cinnamon/sugar mix and raisins on top. Roll tightly up. Pinch ends together. I love homemade bread. I really need to get my act together and make some. I even have a brad machine that I rarely use. My kitchen is where those appliances go to not be used much, I'm afraid!